When I started writing this blog earlier in the year, I knew absolutely nothing about diabetes beyond my own ability to live with and manage it. I didn’t even think that there were many diabetes blogs out there, let alone good ones. And little did I know that there was a whole community of people with diabetes out there to connect with, that I had missed out on for five long years. I joined Twitter, where a few kind people reached out and followed me. I discovered the wonderful Oz Diabetes Online Community, and have joined them every Tuesday night since. I took part in my first Diabetes Blog Week, where I connected with many other people with diabetes who I have kept in touch with ever since. I have recently signed up for TuDiabetes, which has forums filled with lively diabetes discussion. I am also starting to venture into friendly Facebook groups, and launched a Facebook page for this blog last week as well (care to send a like my way?). The DOC ignited my passion for diabetes. The DOC is one of the best sources of inspiration, conversation, motivation and support when living with diabetes. And the DOC is by far what motivates me to write and share through this blog each and every day. Throughout my day, I get to see what’s going on in the DOC in Australia. Some of my DOC friends in the US will post updates about how their night is going (obviously not good, if diabetes is keeping them awake!). From late afternoon, my DOC friends in the UK will begin to emerge and give us their first thoughts of the morning. And then from early evening, the biggest DOC market, the US begins to emerge. There’s always breaking news, interesting stories to read and people’s thoughts to engage my mind with. It’s hard not to feel a little overwhelmed, or even addicted to something which runs 24 hours a day, right across the world. It certainly can be difficult to go to sleep when there’s a whole other world out there that’s awake and buzzing with information. I certainly don’t want to give up something that I feel so strongly about and get so much out of. But I absolutely hate the fact that the DOC can be very time consuming. And I do feel as though I need a break from it sometimes for the sake of my wellbeing. Athough I don’t do it often enough, I feel good when I switch off from the DOC a few hours before bed. I feel calmer and happier. I feel good at the thought of having time to myself. And it’s far easier to fall asleep when my mind isn’t swimming with DOC thoughts and information. I would love to get into a regular habit of switching off social media for at least 10 hours at night. And I need to remind myself more often that the DOC is still going to be there to catch up with in the morning. Ever feel like you’ve gone through a DOC burnout? 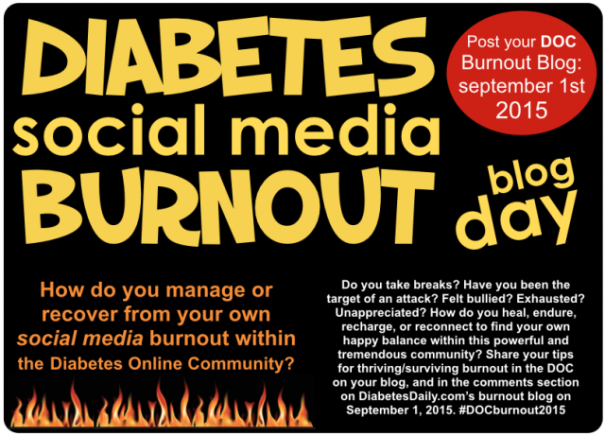 Today is Diabetes Social Media Burnout Day, and Diabetes Daily invites you to share your burnout stories and tips. Thanks for sharing this, Frank. Totally agree that it’s good to find that balance and switch off from the DOC, even a little before turning in for the night. I remember being in that same boat, where I was up at late hours interacting with friends. It was fun, and I do miss that. But it is so time consuming, and it began cutting into my own real non-D job. Finding that balance is so important. No matter how much time we spend in the DOC and online, it’s great to have your voice be a part of this. Thanks for sharing!